Removes the mystery behind that magically unique flavour of your local Indian Restaurant. Here it is; the solution to finding that authentic Indian takeaway flavour COOKED BY YOU using JUST ONE EASY METHOD and JUST FIFTEEN READILY AVAILABLE SPICES. Not only will you be able to recreate that unique Indian restaurant flavour, you will be able to prepare numerous dishes to satisfy everyone’s tastes. Nearly all cookbooks show recipes that serve four, six or eight persons. A group of Indian restaurant diners hardly ever order the same dish and that is why ALL RECIPES IN THIS BOOK ARE BASED ON ONE DISH PER PERSON. This book completely removes the mystery behind that magically unique flavour that was, until now, only available from your local Indian Restaurant. I bought this on a whim because it was cheap. I have been very impressed and have not regretted my purchase. The author explains all the basic techniques and includes information about basic equipment and all the spices needed. I like this book mostly because it uses (almost exclusively) supermarket bought ready ground dry spices. So you don't have to spend hours and a small fortune preparing spice mixes and pastes. So far, I have only made one curry, the chicken pasanda. It was fantastic. I love medium spiced curries and usually never bother with mild curries, but I loved this and will certainly make it again soon. Both my partner and fussy toddler loved it too. It was almost exactly like a restaurant/ takeaway version, the only difference is that I used sunflower oil (recommended by the author for health reasons) instead of the traditional ghee. If I had used ghee, it would have been an exact replica. I will be sticking to sunflower oil as I don't want myself or my family eating ghee. Anyway, I will update my review when we try more recipes. Buy this whilst it's cheap. I hope the author brings out a paper format that I can give to friends and family who do not use kindle. I bought this book on a whim, and at 89p for the Kindle version didn't really worry about it not working out. Have tried a couple of the recipes so far and have been very impressed with the results. Great flavours and easy to follow prep and cooking methods meant that the Chicken Korma and the Rogan Jhosh were very well received. I now plan to try something a little more ambitious and perhaps also make some starters. 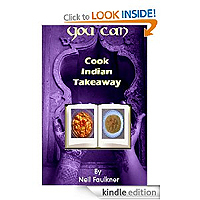 So, I recommend that you download this book and get started on your curry-cooking! The price for this book was fantastic,as I am a curry and chilli head I went for a fiery dish for my first attempt. I made a chicken Tindaloo in next to no time. The flavour was awesome and had a heat which was to my palette I did use bhut jolokia chilli powder for the recipe so it was extremely hot!). I shall be sampling more of the recipes very soon and may post more comments. 1st impressions- I give a big thumbs up and recommend this book- 5 star!